The world’s first animal protest outside the headquarters of the United Nations took place in New York today. 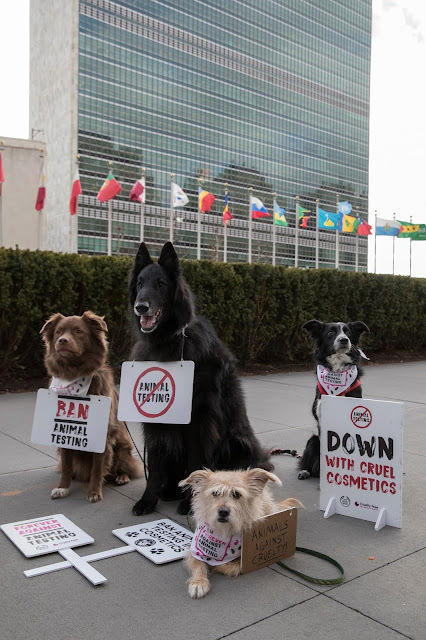 The protest, which included 8 dogs of different breeds and sizes, was in support of Forever Against Animal Testing, a joint campaign by international beauty company The Body Shop and leading organisation working to end animal experiments, Cruelty Free International. The dogs took to the streets with protest signs, bandanas and miniature banners in show of their support. The Body Shop and Cruelty Free International were joined by influential pet photographer @TheDogist, who has previously supported the campaign in Canada and the US, and influential Instagram pet influencer @louboutinanyc. The protest aimed to highlight the shocking fact that 80% of countries worldwide still have no laws banning cosmetic animal tests and encourage consumers to support the campaign by signing the global petition at http://www.foreveragainstanima ltesting.com. Once the petition reaches 8 million signatures, The Body Shop and Cruelty Free International will present it to the United Nations, calling for an international convention to ban animal testing on cosmetics to protect millions of animals around the world. Last week, the organisations met with UN officials to progress discussions on the topic. Having gathered 4.1 million signatures in the last six months, the petition is now the biggest ever against animal testing in cosmetics. The Body Shop and Cruelty Free International are inviting all companies that are against cosmetic animal testing to pledge support for the campaign, and is supplying assets to help other companies and their employees get involved. In September 2017, The Body Shop was acquired from L’Oreal by Natura, the Brazilian-listed multi-national cosmetics company, which is cruelty-free and a publicly-listed B Corp. Both Natura and The Body Shop’s new sister company, Aesop, have today officially backed the campaign. Jessie Macneil-Brown, Head of Global Campaigns, The Body Shop, says: “At The Body Shop we believe passionately in animal welfare and that animals shouldn’t be used for cosmetic testing. 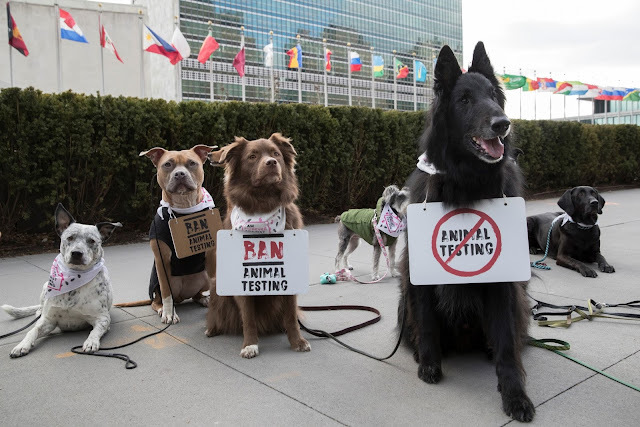 We staged our animal protest with dogs, as they have been a powerful symbol for us throughout our Forever Against Animal Testing campaign, representing the relationship we have with animals and connecting with our cruelty-free supporters. This unique protest is symbolic of our huge ambition for ending cosmetic animal testing globally. We are now calling on every person, every company and every government to join our campaign, and help us finish what we started”. Michelle Thew, CEO of Cruelty Free International says: “Today’s protest sends a strong message to consumers and brands around the world that we need their support. We have made huge progress towards our goal of banning animal testing for cosmetics, but there is still work to be done. We want to see every company that is against animal testing pledge their support and encourage their customers to do the same”. The photos were taken at 10am EST in New York, working with professional dog training and veterinary support. An excellent standard of care was provided for participating animals, and Rational Animal as well as Cruelty Free International consulted to ensure the stunt was structured in a way that causes no distress to the animals. Founded in 1976 in Brighton, England, by Anita Roddick, The Body Shop is a global beauty brand. The Body Shop seeks to make a positive difference in the world by offering high-quality, naturally-inspired skincare, hair care and make-up produced ethically and sustainably. The Body Shop pioneered the philosophy that business can be a force for good and this ethos is still the brand’s driving force. The Body Shop has more than 3,000 stores in more than 60 countries. Cruelty Free International is the leading organisation working to create a world where nobody wants or believes we need to experiment on animals. One of the world's longest standing and most respected animal protection organisations, it is widely regarded as an authority on animal testing issues and called upon by governments, media, corporations and official bodies for advice and expert opinion.